Wangdü (Tib. དབང་སྡུད་, Wyl. dbang sdud) is the common abbreviated title of the prayer by Mipham Rinpoche called The Great Cloud of Blessings: The Prayer which Magnetizes All that Appears and Exists (སྣང་སྲིད་དབང་དུ་སྡུད་པའི་གསོལ་འདེབས་བྱིན་རླབས་སྤྲིན་ཆེན་, snang srid dbang du sdud pa'i gsol 'debs byin rlabs sprin chen). It was written in 1879. This prayer is called “that which brings within one’s power all that appears and all that exists’. It goes by such a name because if you make this prayer fervently, you will be able to magnetize or bring within your power the phenomena of the entire universe. This comprises both the inanimate environment and its animate inhabitants, sentient beings. According to Sogyal Rinpoche, ‘If you look more deeply, Wang Dü is magnetizing but it is also taming your mind. Transforming your mind is the most powerful Wang Dü. Practicing Wang Dü brings more wang tang. The central deity is Pema Gyalpo portrayed in Sambhogakaya form. Hayagriva is on the top left. Guhyajñana the dakini is on the right side of Pema Gyalpo. Vajravarahi, the dakini is on the left side of Pema Gyalpo. Kurukulla is in the bottom right corner. Döpé Gyalpo is in the bottom left corners. The Wang Dü prayer flag contains both images and prayers. In the prayer flag flown at Rigpa centres the images are of the deities mentioned in the prayer and are based on a print of a thangka given to Sogyal Rinpoche by Khenpo Jikme Phuntsok. Normally, mantras and prayers are the main feature of prayer flags, rather than images, so it is the prayer that is the main thing, as it says in the text. The Wang Dü prayer flags are usually printed on red cloth, the color of magnetism. Oral commentary by Khenpo Namdrol. Wang Dü is a very powerful practice and, actually, a very sacred practice. So much so that some nyingma lamas guards it as something quite secret, and do not reveal the practice of Wang Dü . Previously, the Wang Dü prayer flag was not widely distributed and was considered secret or, perhaps, personal. Someway, the success of all the enlightened activity of Khenpo Jikme Phuntsok is attributed to the practice of Wang Dü. […] During winter, there used to be almost 65,000 students in Larung Gar. Khenpo Jikphun used to give 10 rupees to all practitioners, requesting each of them to accumulate Wang Dü prayers. Together, they have accumulated millions and millions and millions of Wang Dü. That is why Khenpo Jikme Phuntsok has been able to turn the mind towards the Dharma to so much people, and make Larung Gar this great center. Chagdud Tulku Rinpoche sent us this Wang Dü prayer, he faxes us it to do it many years ago. It was also Nyoshul Khen Rinpoche ‘s suggestion to do also Wang Dü. Tulku Pegyal Rinpoche also asked us to do Wang Dü, and then, Khenpo Jikme Phuntsok. Recently this image has been printed in the Rigpa Calendar, following advice that this would be beneficial. ↑ Khenpo Sodargye explains that “this thangka was commissioned by Khenpo Jigme Phuntsok, who asked a famous artist to paint it. The thangka is called “The Nine Yidams”. 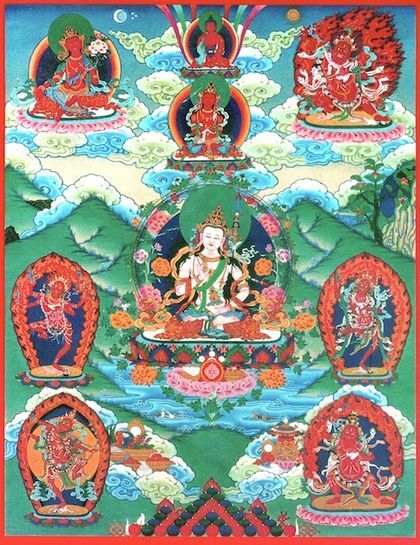 Although different masters have different views on the Nine Yidams (as shown in Metrul Tenzin Gyatso’s commentary to the Wangdu prayer), this ritual of the Nine Yidams is a terma of Padmasambhava, revealed by Tertön Lerab Lingpa, Khenpo Jigme Phuntsok’s previous incarnation. The Wangdu prayer was composed by Mipham Rinpoche. The order of the Wangdu prayer does not correspond completely to the Nine Yidam practice, but enough for this thangka to be relevant. The main objects of supplication in the Wangdu prayer are these nine yidams, each surrounded by an assembly of countless deities”. ↑ Khenpo Namdrol, Commentary on the Wang Dü prayer, 1998, Rigpa. ↑ Sogyal Rinpoche, Background of Wang Dü, Lerab Ling, 1 June 2009. ↑ Sogyal Rinpoche, Oral teaching on Wang Dü, Lerab Ling, 17 August 1996. This page was last edited on 4 July 2018, at 10:10.